Contracted by a London based customer to supply an improved replacement for a previous CHP system that had failed, Adveco was recently presented with the challenge of locating a new TOTEM micro-CHP system into the existing plant room which offered only step access, raised concrete room dividers and narrow routes of access due to the existing HVAC installation. Fortunately, the compact form factor of the TOTEM T10, despite weighing in at 720 kilos, meant navigating tight spaces should be relatively easy. If needs be the entire unit can be stripped down into separate parts and then reassembled once moved to a new location, usually within a single working day. In this case, it became clear that a set of temporary timber ramps and supported bridges would suffice. With these built on location by Adveco’s engineering team, it was a simple and amazingly fast operation to bring the TOTEM onto site for installation and commissioning by the team. 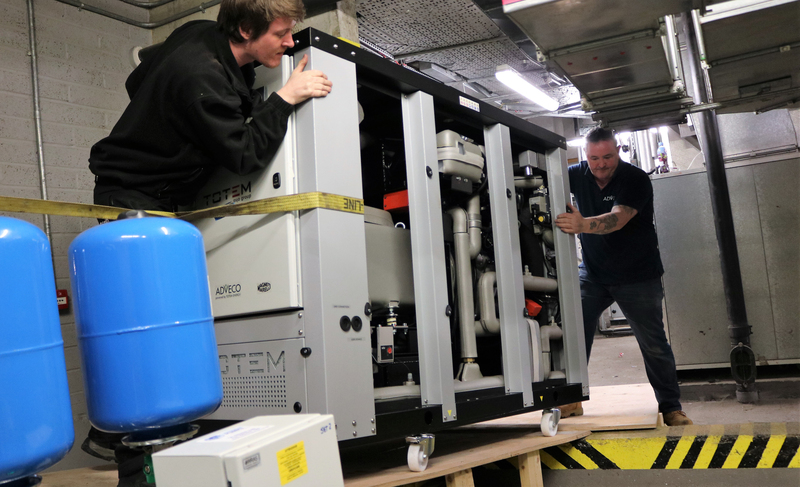 Adveco’s specialist team of engineers navigated the issues of the site for a flawless install, and the customer can now take full advantage of cogenerated electricity and recovered heat from the unit to make considerable operational savings and guarantee accurately modelled return on investment. With Adveco providing remote monitoring, service and maintenance call out for the TOTEM, the new m-CHP will continue to provide energy and heat for years to come. 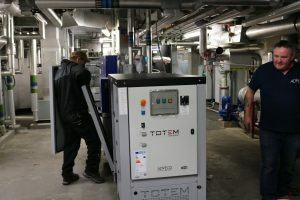 With assured quality of performance from Adveco, the TOTEM T10 delivers a refurbishment investment that comes with peace of mind for the customer, alongside all the advantages of a resilient, onsite source of power and heating whenever there is demand. Watch the video of the delivery and locating of the m-CHP for installation by Adveco.